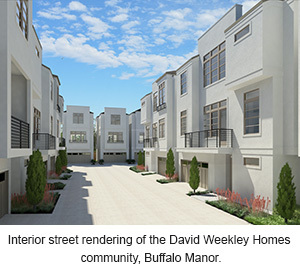 Houston, TX (September 29, 2015): David Weekley Homes, the nation’s largest privately-held builder, has opened The Stoneyfield, a new model home in Buffalo Manor. Located in Braeswood Place, Buffalo Manor features 18 three-story, single-family homes within a private, gated community. Prices start from the $440s. Showcasing the best of what Buffalo Manor has to offer, The Stoneyfield model features three bedrooms, three full baths and one half bath within three stories and more than 2,000 square feet. Overlooking the dining and family rooms, the kitchen includes an oversized island, golden paradise granite countertops and under-cabinet lighting. Each of the homes in this community feature stucco exteriors and contemporary iron railings, as well as 11-foot ceilings on the main living floor and in the owner’s retreat. Buffalo Manor is situated just north of 610 South and west of Buffalo Speedway and between South Main Street and Murworth Drive, and offers easy access to such local attractions as NRG Stadium, the Houston Zoo and the Museum District. For more information about Buffalo Manor, please contact 281-249-7798.